Halloween is just around the corner, and with it comes all kinds of different seasonal treats. This time of year is pretty much a free pass to eat candy and sweets. But how does that saying go? “With great power comes great responsibility,” and as humans, we have the responsibility to stop perpetuating the cycle of gross Halloween candy and treats. Though some of these might be considered traditional Halloween staples, they shouldn’t be and should be avoided at all costs. I think I’ve met maybe one person in my entire life who actually enjoys candy corn, yet I remember it being at every Halloween party I’ve ever been too. I’m not sure how candy corn actually became the go-to Halloween treat because it is so disgusting. Candy corn is a disgrace to both candy and corn, and really the only way it relates to either is because it is made with high fructose corn syrup. In theory the nice yellow orange pattern of the candy is very festive, but honestly there are much better ways to get your sugar fix on Halloween. Just say no to candy corn. I know a lot of people will disagree with me about this, but I could gladly go without caramel apples. I guess I could include candy apples with this as well, though I feel they are less prevalent. A lot of my dislike for this candy probably has to do with my dislike of caramel, but there isn’t really anything fun about a food that will get stuck in my teeth (and maybe even my hair, if I’m being honest). Those caramel apple suckers can go away too. There are better ways to get your caramel fix, and better apple flavored candies as well. Unless you’re at a county fair, there’s really no need for this sticky, teeth breaking food. This should be a no-brainer, pardon the pun, but food shaped like body parts is always a no-go. A cake shaped like a foot, for example, is innocent enough, but it is rarely that simple. Because of the time of year, there’s always “blood” or ooze or something else gross added to it that makes it wholly unappetizing. Plus most of the body part shaped foods are brains, eyeballs, and skulls, not something that is generally appealing when you’re thinking of food. Body parts and related grossness are best kept solely as Halloween decorations and should be kept far away from the food table. Again, this is another one that should go without saying, but there is no reason to serve foods that look like or are decorated with spiders. While, yes, being creepy and gross is part of the charm of Halloween, there is no need to inflict spiders upon the masses. Besides, most people dislike spiders so much that they won’t even want to eat a cake shaped like one. Honestly, I’d say get rid of them in your Halloween decorations as well, but I realize the importance of a well-placed spider scare. Other bugs or reptiles are kind of a grey area, so use your best judgment when considering incorporating them into your food decorations. While handing out apples and toothbrushes has somewhat fallen out of favor, it’s still for the best that you don’t hand them out to trick or treaters. Giving our crackers or nuts isn’t as bad, but considering it’s the one day a year parents are allowing their children to solicit candy from strangers, it’s nice to oblige. Besides, the majority of parents portion out their children’s Halloween candy, so giving out some sort of healthy protest snack won’t make much of a difference anyway. While the intent of handing out something healthy is admirable, it’s Halloween! Be festive and indulge with some candy (just not candy corn). Of course, this only scratches the surface of Halloween treat-related mistakes. There are plenty of individual candies, for example, that should not only be banned from Halloween, but also year-round. (I’m looking at you, Almond Joy.) 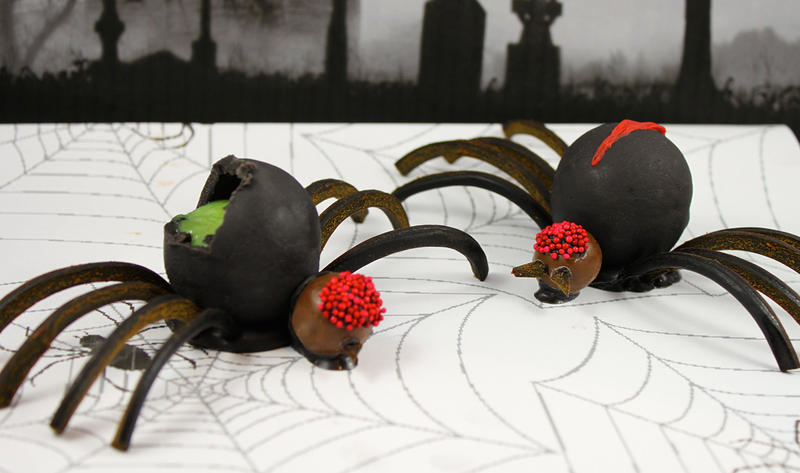 So, when it comes to making or buying Halloween treats, use your best judgment and always avoid spiders. Have a least favorite Halloween treat? Let us know in the comments!